US President Donald Trump has called for a "new unity", a day after a campaign-style rally in which he attacked political foes and media. Speaking in Reno, Nevada, Mr Trump said "we are one people with one home and one great flag". "In America, we never lose faith, we never forget who we are, and we never stop striving for a better future," he told the American Legion. Hundreds of protesters gathered outside the convention centre as he spoke. 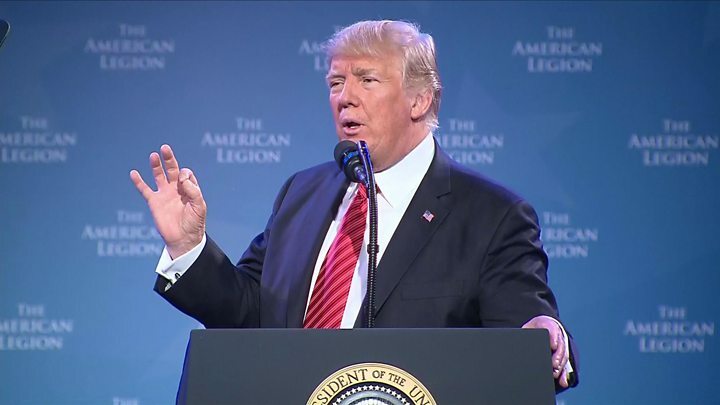 In a 22-minute address to the veterans' group, Mr Trump read from a teleprompter as he said: "It is time to heal the wounds that have divided us, and to seek a new unity based on the common values that unite us." He told his audience of more than 5,000 that in the US, "we are not defined by the colour of our skin, the figure on our pay cheque, or the party of our politics. "We are defined by our shared humanity - by our citizenship in this magnificent nation, and by the love that fills our hearts." 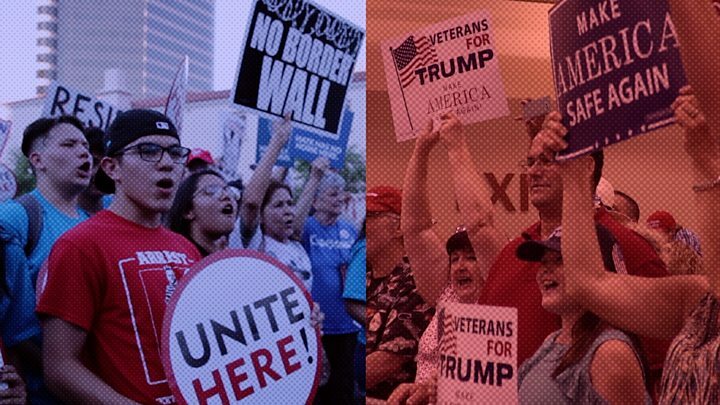 At a raucous rally in Arizona the night before he railed against that state's two senators, both fellow members of his Republican party, and Democrats. In his 80-minute speech, Mr Trump threatened to shut down the government unless funding was approved for his proposed wall on the US-Mexico border. He also excoriated media coverage of his statements about violence at a white supremacist march in Charlottesville, Virginia, earlier this month. Mr Trump selectively quoted his initial response, omitting his much-criticised remark that "many sides" were to blame for clashes that ended with a counter-demonstrator killed. He also accused the "damn dishonest media" of "trying to take away our culture". 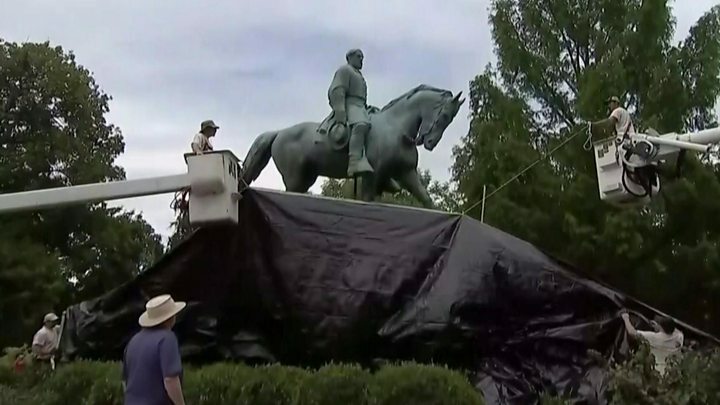 "They're trying to take away our history," he added. As he spoke, protesters clashed with police outside the venue in central Phoenix. After Mr Trump's speech on Wednesday in Nevada, Republican Senate leader Mitch McConnell denied a New York Times report that he was angry with the president and doubtful of his ability to lead the party. "We are committed to advancing our shared agenda together," the Kentucky senator said, "and anyone who suggests otherwise is clearly not part of the conversation." At the conclusion of Mr Trump's latest speech, he signed into law a measure making it easier for veterans to appeal for disability allowance after their claims are denied. Earlier this week, he laid out his plan for US troops in Afghanistan, and met with border control agents near the US-Mexico border.